The three-dimensional heterogeneous anthropomorphic phantom representing a standard Indian reference adult phantom and the brachytherapy sources are simulated using Monte Carlo code MCNP Version 3.1  in the photon mode. The phantom model is based on the MIRD specifications scaled down to the average Indian reference man of 164 cm height and 53 kg. The brachytherapy sources (microselectron 192 Ir source and BEBIG 60 Co) were modeled for each brachytherapy treatment conditions of esophagus, neck, and breast cancers. Exact geometry of the high dose rate microselctron 192 Ir source and BEBIG 60 Co sources is modeled in all the cases. , The three cases of esophagus treatments, i.e. upper esophagus, middle esophagus, and lower esophagus, are considered. For this, the whole volume of the esophagus is divided into three equal regions along the length as the upper, middle, and lower esophagus. The location of the brachytherapy source is assumed at the geometrical center of each region of the esophagus of the phantom. For the treatment of breast, the sources are modeled at the center of the breast volume. The source is modeled at the middle of the larynx region for the neck treatment. Although the source may take different dwell positions during the treatment, the assumption of source at the center is expected to provide the mean dose value for all the dwell positions. The source spectrum of the 192 Ir source is taken from Ballester et al. and that of 60 Co is 1.17 and 1.33 MeV with a yield of about 100% for each photon per disintegration. In the Monte Carlo calculations, the source particles are sampled from the active volume of the cylindrical source. Ten million histories are simulated. The photon energy cut off used in the simulation is 1 keV. The mean photon energy fluence spectrum is scored in the selected organs using track length estimate and subsequently converted into tissue-kerma using mass energy absorption coefficient of tissue  by using DE and DF tally cards of MCNP. DE and DF cards are used to convert fluence to tissue kerma. Tissue-kerma is approximated to absorbed dose assuming charged particle equilibrium exists. The existence of charged particle equilibrium can be assumed as the estimations are the average dose to the organs. The maximum range of the secondary electrons produced are of 4-5 mm in tissue, and can be considered as absorbed completely within the organ volumes that are in the order of few centimeters. The code utilizes old photon cross-section dataset. The suitability of using this code is verified by comparing MCNP3.1 calculations with EDKnrc code of the year 2000. The beta emission by the sources is ignored in the simulations as they are expected to be stopped by the encapsulation and do not contribute to the doses to the nearby healthy organs. 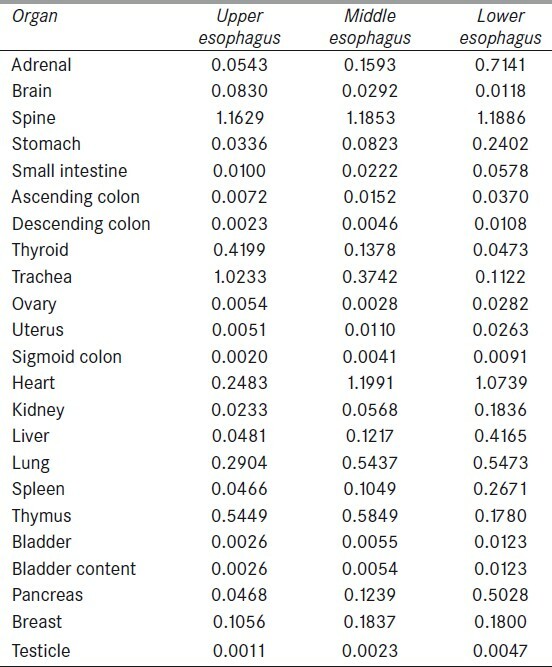 The mean organ dose factors in mGy/min/GBq with 192 Ir sources in upper, middle, and lower esophagus, and with 60 Co (BEBIG) source are presented in [Table 1] and [Table 2], respectively. The organ doses for the left and right breast treatments are tabulated in [Table 3] and the results for the neck treatment are in [Table 4]. The dose to adrenal, lung, ovary, kidney, and testicle is the average of the left and right organ. 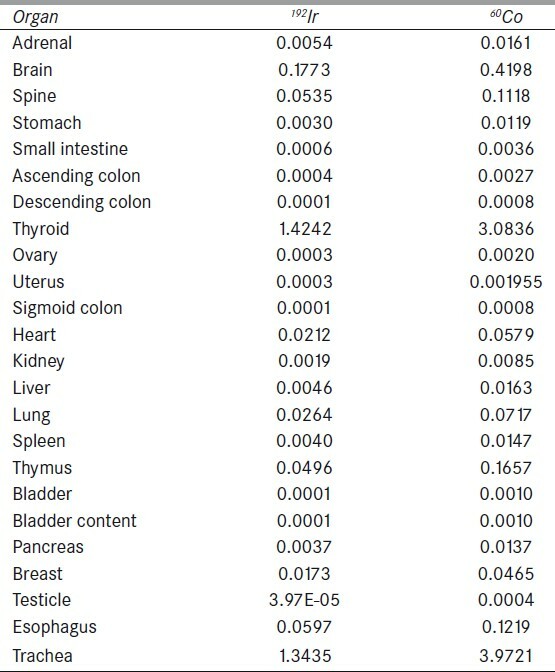 The relative standard deviation of the doses is less than 4% for all the organs for all esophagus, breast, and neck treatments except for the organ, testicle. The relative standard deviation of the dose to the testicles is about 6% for the left and right breast treatment using 192 Ir. The same during upper, middle, and lower esophagus treatment case using 192 Ir are about 8%, 6%, and 3%, respectively, and it is about 11% when the 192 Ir source is in the neck. 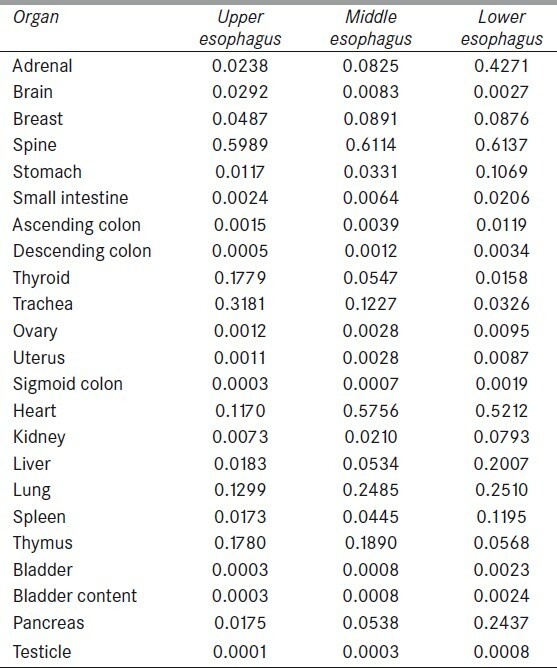 The relative standard deviation of the dose to all the organs treated with 60 Co sources is lesser than that of treated with 192 Ir. The computed mean organ dose values of this study for brachytherapy of left breast with the 192 Ir source is compared with the mean organ dose values published by Mille and Xu. The present study uses a MIRD-type heterogeneous phantom 164 cm height and 53 kg weight, whereas the study by Mille and Xu is 163 cm height and 60 kg weight voxel-based phantom simulated using the CT information. As the overall external dimensions of the phantom models being nearly the same, the comparison of results can provide an insight to the influence on the organ dose values computed using MIRD based phantom model and the sophisticated voxel based phantom model. The organ dose values are expected to vary for both the studies because the models have different parameters such as dimension of the organs, the interspatial distance, and the degree of heterogeneity between the source and target organs. The dose values of the published study are presented in Gy for a dose of 34 Gy in water at 3.2 cm from the center of the source. 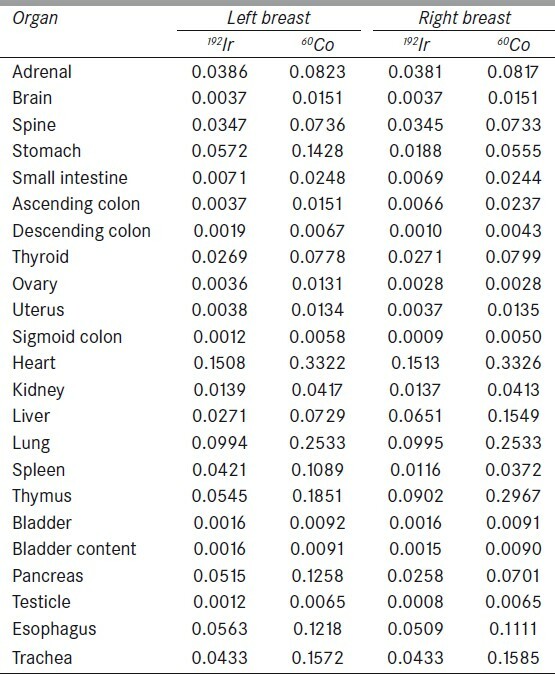 Hence, for the purpose of comparison, the organ dose values obtained by this study are also converted to the similar units. For this, the dose in water at 3.2 cm is obtained by simulating a 192 Ir point source at the center of a cylindrical water phantom of 30 cm diameter and 15 cm height. The energy fluence spectrum was scored in a ring at 3.2 cm from the source and converted into the dose using appropriate conversion factors. [Table 5] presents the comparison of the normalized organ doses for six organs; the organ masses and the distance between the source and the organ used in the present study and published study. The interspatial distance is the distance between the center of the organ and the center of the source for the present study and the mean distance from the organ to balloon center for the published study. It is observed that for the organs, namely brain, uterus, left and right ovaries, the dose values of the present study are less compared to those of the published study and these are located at larger distance in the present model when compared to the voxel model. Similarly for spleen and heart, the dose values of this study are higher than the published values and these organs are at smaller distance in comparison with the voxel model. The variation is observed between 8% and 50%. The normalized organ dose factors are generated during the brachytherapy treatment of esophagus, breast, and neck cancers using 192 Ir and 60 Co sources to an Indian reference patient. The data is useful to assess the representative dose specific to the Indian population for radiation protection purposes. The organ dose values of the breast treatment case are compared with a similar Monte Carlo simulation study and found agreeing. 1. Taal BG, Aleman BM, Koning CC, Boot H. High dose rate brachytherapy before external beam irradiation in inoperable oesophageal cancer. Br J Cancer 1996;74:1452-7. 2. Hennequin C, Durdux C, Espi´e M, Balla-mekias S, Housset M, Marty M, et al. High-dose-rate brachytherapy for early breast cancer: An ambulatory technique. Int J Radiat Oncol Biol Phys 1999;45:85- 90. 3. International Commission on Radiological Protection, Recommendations of International Commission on Radiological Protection, ICRP Publication 60.Ann. ICRP 21(1-3). Oxford: Pergamon Press; 1991. 4. Mille MM, Xu XG. Comparison of organ doses for patients undergoing balloon brachytherapy of the breast with HDR 192 Ir or electronic sources using Monte Carlo simulations in a heterogeneous human phantom. Med Phys 2010;37:662-71. 5. Xu XG. Effective dose for patients undergoing coronary and femoral intravascular radiotherapy involving an HDR 192 Ir source. Radiat Prot Dosimetry 2005;115:289-93. 6. Usgaonker SR. MCNP modeling of prostate brachytherapy and organ dosimetry, Texas A and M University, M.Sc. Dissertation, 2003. 7. Kim JH, Kim CS, Whang JH. Assessment of radiation dose for surrounding organs and persons approaching implanted patients upon brachytherapy of prostate cancer with iridium-192. Radiat Prot Dosim 2010;141:283-8. 8. Snyder WS, Ford MR. Warner GG, NMMIRD pamphlet No 5, Revised.1978. 9. Biju K, Nagarajan PS. Computed normalised effective doses to an Indian adult in conventional diagnostic X-ray chest examinations. Radiat Prot Dosimetry 2000;88:119-27. 10. Biju K. Evaluation of organ doses in brachytherapy treatment of uterus cancer using mathematical reference Indian adult phantom. Radiat. Prot. Dosim. 2012; 148:185-188. 11. Syh J, Chu W, Pradeep Kumar P. Measurement and estimation of organ exposure for brachytherapy. Proceedings of Twelfth Southern Biomedical Engineering Conference.1993;208-210. 12. Los Alamos National Laboratory (LANL). Manual on MCNP (Version 3.1): A general Monte Carlo code for neutron and photon transport: Los Alamos, NM, LANL. 1983. 13. Terribilini D, Manser P, Frei D, Volken W, Mini R, Fix MK. Implementation of a brachytherapy Ir-source in an in-house system and comparison of simulation results with EGSnrc, VMC++ and PIN. J Phys 2007;74:12-22. 14. Granero D, Pérez-Calatayud J, Ballester F. Technical note: Dosimetric study of a new Co-60 source used in brachytherapy. Med Phys 2007;34:3485-8. 15. Ballester F, Herna´ndez C, Pe´rez-Calatayud J, Lliso F. Monte Carlo calculation of dose rate distributions around 192 Ir wires. Med Phys 1997;24:1221-8. 16. Hubbell JH, Seltzer SM. Tables of X-ray mass attenuation coefficients and mass energy absorption coefficients. National Institute of Standards and Technology. 2006. Available from: http://physics.nist.gov/ PhysRefData/XrayMassCoef/tab4.html [Last accessed on 2011 Feb]. 17. Storm E, Israel HI. Photon cross sections from 0.001 to 100 MeV for elements 1 through 100. 1967; LA-3753. 18. Biju K, Palani ST, Lavale DS. Monte Carlo simulation of various source-product geometries for a proposed multi product gamma irradiator facility. Health Phys 2009;97:187-94.